110523-N-KB563-134 LAE, Papua New Guinea (May. 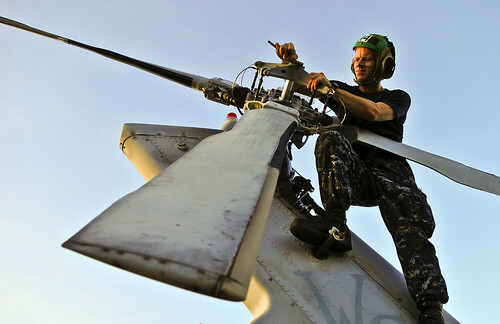 23, 2011) Aviation Electronics Technician 3rd Class Joe Jenkins checks for corrosion on the tail rotor of an MH-60S Sea Hawk helicopter aboard amphibious transport dock ship USS Cleveland (LPD 7). Pacific Partnership is a humanitarian assistance initiative, which promotes cooperation throughout the Pacific, which will visit five island nations this summer: Tonga, Vanuatu, Papua New Guinea, Timor-Leste, and the Federated States of Micronesia.